Mark Feeeesh who is acting as an ambassador for the South African World Cup joined us from Bolton in November 2000 and was a regular for four seasons but by the 5th his fitness was called into a lot of questions as was the media work he was doing back in South Africa and sadly at the age of just over 30 his career ended. He is currently going through a high-profile divorce in South Africa. Jorge Costa made quite an impression during a half a season loan from Porto. Despite being club captain at Porto the then coach froze Costa out of the club and Curbs stepped in stealth-like and signed him for 6 months in December 2001. In just 22 games (13 at home) he became the darling of the Covered End and spawned an ageless song. He played alongside both Fish and Fortune with Rufus injured and his ferocious commitment is well remembered. Meanwhile Porto's fans forced their coach to resign and Costa or the Tanque as he was known was welcomed back and played for another four seasons and lifted the Champions League in 2004. Costa is now manager of S.C. Olhanense in the Algarve. No doubts to the most prolific goalscorer from centre-half during the past decade. Moroccan Talal El Karkouri was not blessed with the best awareness, and was certainly prone to sloppy tackles but El Kak did however give us plenty of feel good moments in his three seasons with the club, none more so than when taking free-kicks from long distances. One at home to Arsenal and one in Les Reed's only win against Blackburn stick in the memory. 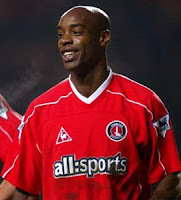 I have included Christian Dailly from the 2009 vintage on my list because I credit him with a lot of what has been good at Charlton this season. The Scotsman is Scotland’s 6th most capped player and has had a stellar career and I am more than happy that he chose to add us to his impressive résumé. If things had been different during the summer, then Jonathan Fortune may well have been lining up alongside Dailly but finances meant that Fortune, I think almost begrudgingly, had to seek out a career elsewhere and is currently playing in Sheffield United's reserves. It was at the very beginning of this decade that Fortune made his league debut but for Mansfield and his first game for the Addicks wasn't until the opening game of the 2001/2 season when he came on at half-time at home to Everton. Although whilst hardly ever unifying Addicks as to his abilities there was no doubting Jon's loyalty during his many years at the club and his 82nd minute headed goal in a game against Crystal Palace in May 2005 will be a lasting legacy. My two Team of the Decade centre-halves pick themselves however. Yes there was Costa’s heart, Fortune’s loyalty, El Karkouri’s free-kicks, Fish’s calm, and now Dailly’s influence but they have nothing on two men I have had the pleasure to call Charlton players. By the time Richard Rufus came onto the scene I was a bit old to have a favourite player, but he was my favourite player and there were seasons when if he wasn’t on the team sheet for a game, we realistically didn’t have a cat in hells chance of winning. Richard read the game brilliantly, his tackling was almost flawless, he had the pace of a cheetah and when he scored that goal at Wembley my life could have stopped right then because whatever was to happen next would never have been so beautiful. Rufus is a legend and it still saddens me that a knee injury ended his career at just 29 years old, and he never did get that England cap that he deserved. His final game was at Anfield in May 2003. Blithely I could have picked Steve Brown in any position for my Team of the Decade. I could have played him anywhere and he would never have let me down. During our relegation season (the last one) I used to listen to Brown on Radio London and in his voice you could hear how much our demise hurt him. Brighton born Brownie made his debut in September 1991 but in this decade helped us win the Championship title and then played three Premiership seasons often filling in anywhere and coming on as a sub to settle nerves in the middle of the field late in games. He scored in the wonderous 4-2 win at Highbury but is in my mind equally remembered for almost single-handedly winning the game at home to Tranmere in our promotion season when he came on at half-time with us 2-0 down, played in midfield and scored our first of three goals. Remarkably Brownie played in goal no less than four times and is probably one of the most appreciated Charlton players of a generation. He has just taken his Brighton and Hove Albion youth team to the 4th Round of the Youth Cup.